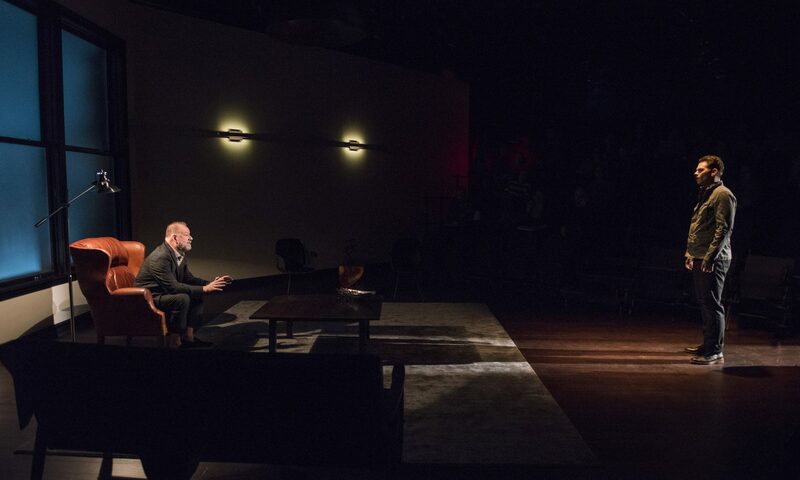 A Number, presented at Writers’ Theatre and directed by Robin Witt, takes place in a world designed by Courtney O’Neill — a spare yet expensive-looking living room, eerily clean, with just a few couches and tables and sculptures. The space feels erudite and smooth, yet the slightest bit empty and creepy. The stage is illuminated by four wall lights that shine a crystal-clear white, and a big window at the back that turns blue and gray and white at key moments in the show; lighting designer Brandon Wardell does admirable work creating tension in the space. We begin with Salter, an older gentleman in a three-piece suit (William Brown), who sits uncomfortably in a leather armchair as he talks to his son Bernard (Nate Burger) about a particularly disturbing run-in the son has had that afternoon with a figure from the family’s past. Both of these characters are named in the program but unnamed in the text itself, and this is effective in giving the proceedings an air of both universality and mystery. Caryl Churchill is of course a playwright who needs no introduction, and this is one of her most masterful works. Through dialogue that perfectly toes the line between lifelike and elevated, she masterfully and slowly reveals information without ever telling the audience too much. As such, we the audience are forced to become the detectives of the story, in a sense; constantly on the edge of our seats, never completely sure of the truth but desperate to figure it out. William Brown performs Salter with a dynamic mix of selfishness, sadness, and discomfort that makes him grounded and compelling, despite all of the character’s horrible decisions. And Nate Burger does fantastic work here, not only in playing Bernard, but swiveling believably through wildly different characters over the play’s five scenes. He is in turns scary, comforting, and quietly angry, balancing melodrama and subtlety with precision. Director Robit Witt, in her Writers Theatre debut, has found creative ways to keep her blocking interesting despite an unchanging set and only two actors; in keeping the focus on the emotional strings that stretch between Brown and Burger, the movement stays dynamic throughout. Her aesthetic works well with Churchill’s suspenseful tone, making us feel shocked, dizzy, and horrified in turn. I’m trying not to give too much away here, but the Writers team has created a perfect piece of high-concept theatre in A Number, using one particular sci-fi trope to ask pointed questions about fatherhood, toxic masculinity, and the ways we try to control those we love. Paced at a taut 65 minutes, A Number packs an effective punch. A Number runs at Writers Theatre through June 9th. Bias Alert: Regina Victor was a dramaturg at Writers Theatre in the past year.